Update, June 6, 2014: Jonathan Kuttab, attorney for the Tent of Nations has provided the first page of an appeal filed by the Tent of Nations dated and recieved May 12, 2014. The text of the document is appended at the end of this article. Those Christian “peace” and “justice” activists and their allies in Christian news outlets are at it again. They are passing on anti-Israel propaganda offered to them by Palestinian Christians in the West Bank as the gospel fact. The logic is if it cuts against Israel, it must be true, because well, you know how those Israelis are (and their Palestinian friends would never mislead them). Right now activists are broadcasting a story about the the destruction of trees in the West Bank. The trees, which were uprooted on May 19, 2014, were planted by the Nassar family, which has been operating a farm in the West Bank since the early 1900s, when the Ottoman Empire controlled the territory. The farm, known as the Tent of Nations, is a popular destination for pro-Palestinian activists from North America and Europe who attend workshops and talks about the evils of the Israeli government and of Israelis who live nearby. The activists who attend these talks dutifully take photos and repeat what they are told to church audiences upon their return home. During these talks, members of the Nassar family recount their legal battles with the Israeli government over title to the land. As a result of these talks, the Tent of Nations had a ready-made audience when the story broke. Daoud Nassar, who was touring the U.S. when the trees were uprooted, gave a hastily organized conference call sponsored by Churches for Middle East Peace the day after the Israelis uprooted the trees. The websites of two Christian magazines, Sojourners and Relevant, published articles about the IDF’s actions after the conference call, as did Al Jazeera’s blog, The Stream, and the Presbyterian Church’ (USA)’s news service. An alert issued by the Friends of the Tent of Nations (FOTONNA), was also posted on a number of mainline Protestant websites, including the Global Ministries Board of the United Church of Christ and Disciples of Christ. “Vortex of … suffering”? Is such hyperbole really necessary? Is it responsible? The story told by Nassar and his allies in the the U.S. and Europe is that Israeli military officials removed 1,500 trees from a valley that the family has owned for generations – since the days of the Ottoman Empire. Adding insult to injury, the IDF removed these trees one week after the Nassar family’s lawyer allegedly filed an appeal with the military court that should have prevented their destruction – at least temporarily. Daoud Nassar told listeners on a conference call organized by Churches for Middle East Peace the appeal was filed on May 12, 2014. 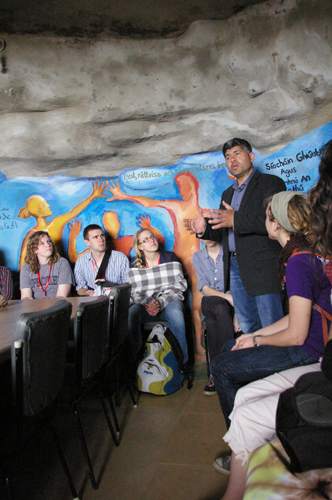 Daoud Nassar speaks at the Tent of Nations in 2012. A post on the Facebook page of the Tent of Nations said the same thing. But this story has some problems. First off, Israeli officials have communicated through the Ministry of Foreign Affairs that the appeal about the valley where the trees were located which Nassar and Tent of Nations said was filed on May 12, 2014 was never filed. This places the onus on Tent of Nations to prove that in fact an appeal was filed (and that this appeal relates to the valley in question), but so far the organization has ignored repeated requests from two researchers to produce the document. Note: Jonathan Kuttab, attorney for the Tent of Nations has provided a copy of the first page of the complaint filed on May 12, 2014. It is appended below. Secondly, the Tent of Nations and their allies have exaggerated the number of trees removed by a factor of five. 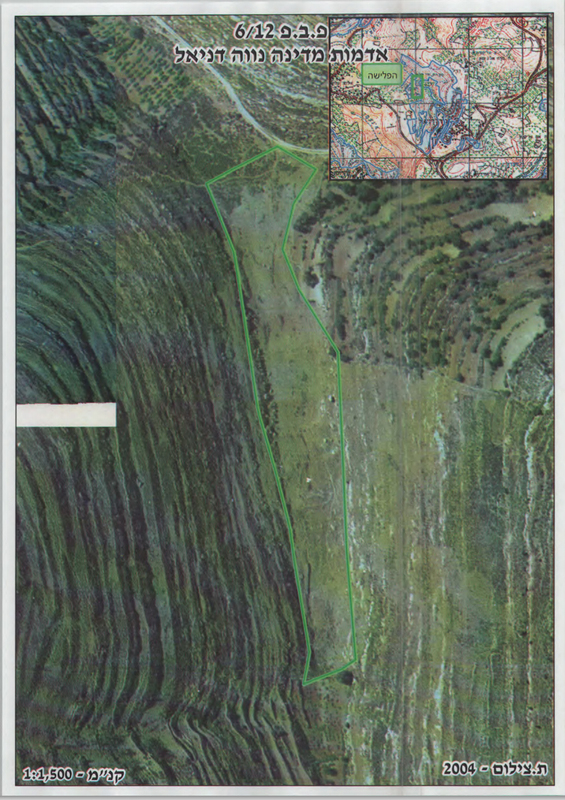 Aerial photographs indicate that about 300 trees were removed from the valley. And lastly, a court ruled in December 2012 that the Nassar family does not have title to the land where the trees were removed. Moreover, aerial photographs of the plot indicate that terraces were built in the valley in 2006 and trees were planted beginning in 2007. If the Nassars have owned the land since the early 1900s, why did they wait so long to cultivate it? There is very little downside for the Tent of Nations to plant trees on land that does not belong to the Nassar family. If the plantings were left unchallenged, they could at some point say the valley was theirs. And if the Israelis did come and uproot the trees as they ultimately did, it would provide fodder for more publicity. t of Nations thrives on publicity, deriving some of its income from outside donations. This controversy increases the farm’s profile substantially. While food production does apparently generate some income for Tent of Nations, its so-called peacemaking activities are also income-makers for the farm as well. Israeli attempts to protect the nature reserve by removing unauthorized, newly planted trees made for plenty of bad optics and dramatic condemnation on the blogosphere. 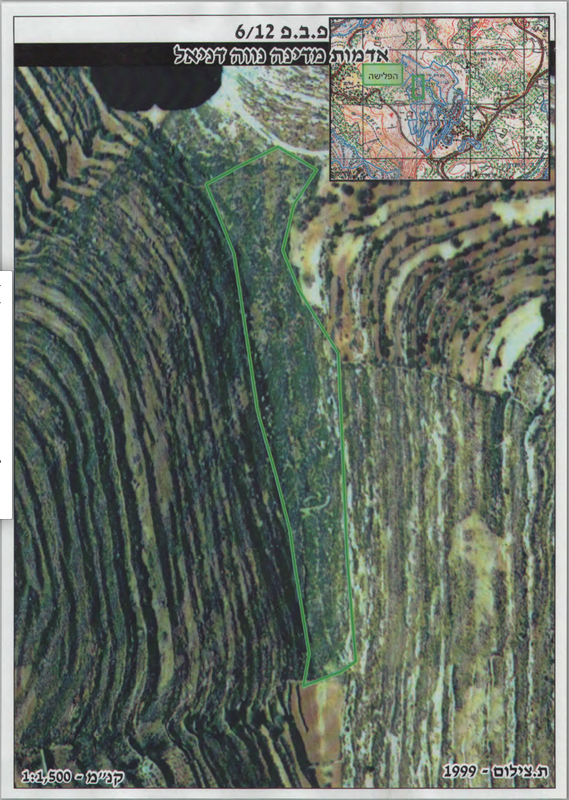 Ultimately, the conflict resulted in a series of legal actions in the Israeli court with a decision to remove the some 1,400 trees from Wadi Kana. Such a removal would be a well-photographed and highly publicized spectacle of the mighty Israeli state versus the humble Arab-planted trees. Subsequently, the organization posted another announcement thanking people for the emails and other expressions of support it had received in response to its previous announcement. This announcement reiterated Tent of Nations’ request that its supporters prepare themselves more action on behalf of the farm. The organization also posted a statement from its lawyer accusing Israel of removing the trees one week after the farm had filed an appeal that he insists should have put a stop to the demolition. “This action is illegal even according to the draconian military laws in place,” he wrote. The posts on Tent of Nations’ Facebook page elicited powerful emotional responses from its supporters, many of whom had visited the farm. What shall we say facing such senseless violence and destruction? All there’s left to me are questions. Are these the “Jewish values”, is that what living to the Tora stands for? And where are all the people who so much cling to these values they claim to love so dearly? Dear Daoud, I’m shocked by this news and it makes me sad. I remember my visit to Tent of Nations very well, and your speech in Driebergen last year also. There was and is so much inspiration and power in your way of living the gospel of peace and reconciliation. Destroying so many of your trees, partly sponsored by people all over the world longing for peace, feels like an attack, a brutal attempt to destroy that very same gospel. I pray for you and your family to overcome this disaster, to find the strength to fight a legal fight, and to keep the spirit alive “we refuse to be enimies.” [Sic]. The story had exactly the impact its purveyors hoped it would. People, Christians especially, got angry and started talking about those terrible Israelis who don’t live up to the requirements of the Jewish faith, destroy the gospel, and break their own laws to boot. Evangelical Activist Shane Claiborne visits Tent of Nations in 2012. One clue about the propagandistic aspect of the Tent of Nations story is that the number of trees being destroyed keeps changing from one source to the next. The United Nations Office for the Coordination of Humanitarian Affairs (OCHA) reported that it was 600 trees that were destroyed. 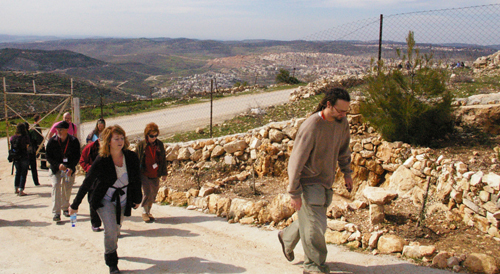 Aerial photographs of the valley provided by the Israeli government indicate that approximately 300 trees were present in the valley. Apparently, a new miracle has taken place outside of Bethlehem. Israeli bulldozers have turned 300 fruit trees into 1,500! The story of the uprooting of the trees, which had generated a lot of traffic on Facebook and Twitter, got more traction as a result of the previously mentioned conference call organized by Churches for Middle East Peace. During the call, CMEP’s executive director Warren Clark introduced Nassar as a Palestinian Christian who runs the Tent of Nations, an educational center that promotes non-violence. One of the points made repeatedly on the CMEP conference call is that the Nassar family has legal title to the valley where the trees were uprooted. Speakers described the valley, which had been uncultivated prior to 2007, as part of the farm, located on a nearby hilltop that had been the family since the early 1900s. When Nassar spoke, he described the history of his farm, stating that his family registered its claim to the land with officials from the Ottoman Empire in 1916. He also stated that the Nassars have documents from the Ottomans, the English, the Jordanians, and the Israelis establishing the family’s ownership of the farm. Nassar then described his family’s legal battle with the Israeli government to keep the farm, which had initially tried to confiscate the land, which had fallen into disuse, in 1991. Under the law inherited from the Ottoman Empire, most farmers maintain claim to their land through continued cultivation. After a few years of non-cultivation, the title reverts back to the state, which in this case is Israel, which controls the land in question as part of the Declaration of Principles it signed with the Palestinian Authority in the 1990s. Because the Nassar family had documentation proving its ownership of the farm, the Israeli Supreme Court ruled in its favor and ruled that the Nassars had the right to register their land with the Israeli government. Nassar stated that Tent of Nations received a “cultivation stop order” for the valley in question about two months previous to the conference call and that on May 12, 2014, his lawyer filed an appeal to the order. Relevant magazine also repeated the accusation, citing Tent of Nation’s Facebook page. Neither Sojourners nor Relevant make any mention of contacting Israeli authorities in an effort to check out the veracity of the story they told. The Presbyterian News Service (PNS) also repeated the allegation, stating that an appeal was filed on May 5, 2014, contrary to the date of May 12, 2012 that Nassar gave on the conference call. The PNS did not mention whether it attempted to contact Israeli officials about the allegations, suggesting that it probably did not. In sum, it appears that three Christian news outlets – Sojourners, Relevant and the Presbyterian News Service – broadcast the story handed to them by Tent of Nations without verifying the facts and without asking the Israelis their side of the story. Interestingly enough, Al Jazeera’s blogger at The Stream did contact the Israeli government about the controversy, but did not get an immediate response. Since the story broke, Israeli officials have stated that they have not received an appeal regarding the valley in question. Maybe the appeal got lost in the bureaucratic shuffle, but the one entity that should be able to produce the text of appeal, and proof of receipt by the Israelis, is the Tent of Nations. This writer and one other researcher have asked Tent of Nations (via email and Twitter), to provide a copy of this complaint, but have not received any response. The Tent of Nations remains free to produce the appeal for inspection so that outsiders can confirm (a) that it exists and (b) deals with the valley in question. The underlying question is whether or not the Tent of Nations has title to the valley where the trees were planted. Information provided by the Coordinator of Activities in the Territories (COGAT) indicates that the answer is no. What none of the publicity surrounding the Tent of Nations story reveals is that there are two legal controversies in play. The December 2012 decision states clearly that the encroachers did not succeed in proving their claims of ownership in the Appeals Committee and therefore their petition was rejected, making it possible to remove the trees. As noted, this plot is designated public land. So what is going on? It appears that the Tent of Nations and its supporters have used the story about its struggle over the hilltop farm to describe what is happening in the valley where the trees were planted and then removed. What makes the controversy regarding uprooted trees in the West Bank so interesting is that it highlights the obsession “peace” and “justice” activists have about the Arab-Israeli conflict, or more to the point, the actions of the Jewish state. While these folks obsess about Israel, war rages in the rest of the Middle East. In the past three years, more than 100,000 Syrians have been killed in a brutal civil war (and that’s a low estimate). Islamist rebels in Syria have mutilated the corpses of their enemies and displayed them on wooden crosses. The Assad Regime, which is fighting to retain power, has, according to U.S. officials, has likely used chemical weapons, specifically chlorine gas, to kill its own citizens, many of them non-combatants. These apparent war crimes have received attention on the part of a few Christian “peace” and “justice” activists in the United States and Europe, but the principle target of outrage for this community has, as of late, been the uprooting of approximately 300 trees in the West Bank by the Israeli Defense Forces. So, while undeniable atrocities take place elsewhere in the Middle East, Christian activists have, as of late, spent their time and energy broadcasting a sketchy story about evil Israelis uprooting trees in the West Bank – with the predictable references on Twitter to Deuteronomy, which condemns the removal of fruit trees during a time of war. At least we know where their heads are at. The destruction of trees in the West Bank sparks more outrage than the murder of human beings in Syria. Clearly the events that took place outside of Bethlehem on May 19, 2014, as described in various Christian outlets, resonated with the anti-Israel crowd who responded to Nassar’s story like lion that has been thrown red meat. It was great propaganda that allowed people to feast on their own pre-existing hostility toward the Jewish state. Over the years, Palestinian Christians have proven somewhat adept at providing these types of stories to their supporters in the West over the years. Outsiders have given them a lot of help in broadcasting these stories. When will these activists wean themselves from this unwholesome diet of misinformation? When will their religious leaders, the people responsible for their spiritual formation, insist that they change their dishonest approach to peacemaking when it comes to the Arab-Israeli conflict? When will they tell their flocks in no uncertain terms that peacemaking, when divorced from truth telling, is not peacemaking, but in fact its opposite? While Sojourners, Relevant, the Presbyterian News Service and other outlets deserve condemnation for failing to check out the story offered to them by Daoud Nassar, CMEP is also at fault. This is the second time in recent memory that the Churches for Middle East Peace has, under the leadership of its current executive director, Warren Clark, assisted in the dissemination of anti-Israel propaganda. A few months ago, CMEP hosted a conference call during which activists from Defense for Children International Palestine told another sketchy story about Israeli soldiers shooting a young Palestinian boy in cold blood. (DCI, by the way, has to the best of our knowledge, not responded publicly to CAMERA’s challenge to its story.) And in years past, under the leadership of Executive Director Corine Whitlach, the CMEP passed on stories of the Israelis undermining the Al Aqsa Mosque. Stories like this have started riots. CMEP’s tendency to serve as a conduit for anti-Israel propaganda from Palestinian sources raises some questions. Is the organization he leads interested in promoting the cause of peace? 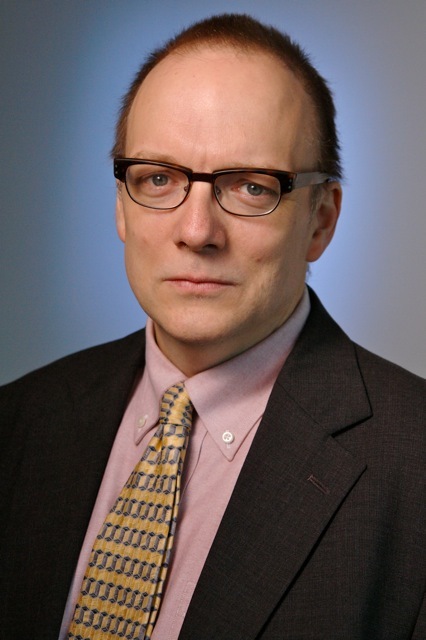 Or is CMEP and its executive director, Warren Clark, more interested in enabling Palestinians who broadcast misinformation about Israel to anti-Zionist Christians in the West who are pre-disposed to believe the worst about Israel and have a thirst for anti-Israel misinformation? 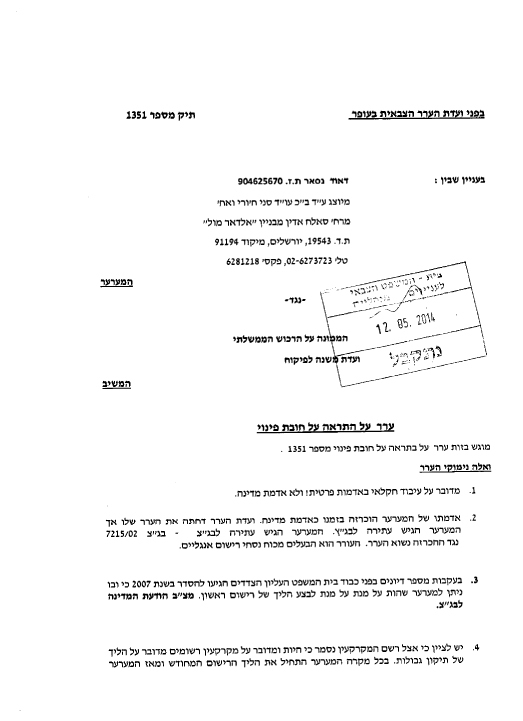 The following information was distributed by COGAT on May 29, 2014.
;One plot is entirely on public land. This plot is where the trees were removed last week (see 1 and 2 below). B. Another plot is partly on public land and partly on private land. On this plot buildings comprising an outpost were constructed without the required building permits. A legal proceeding is ongoing concerning this plot (see 3 below). 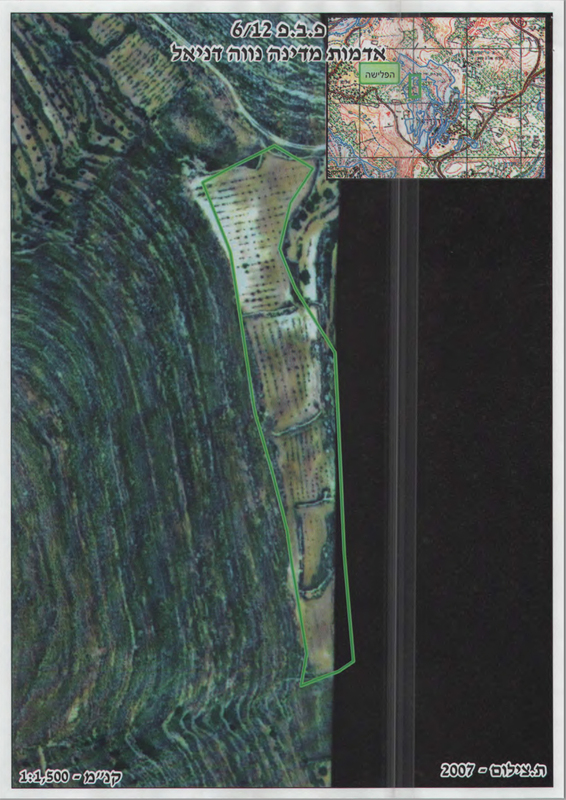 a) The area marked in green in the photographs shows the plot which is the public land on which the trees were illegally planted. 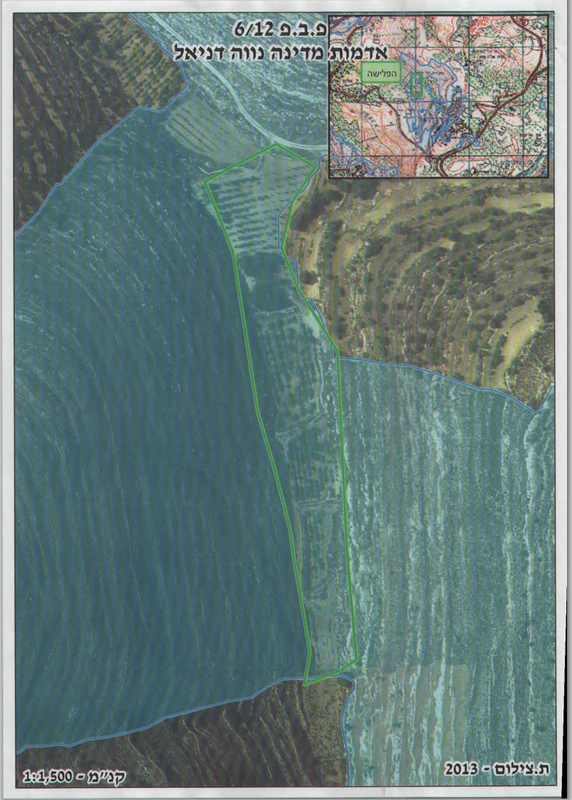 b) The area tinted blue in the 2013 photo shows all the surrounding public land. c) Trees were removed only from public land while the trees on private land were untouched. d) The series of photos show that over the years, until 2006, the area was completely uncultivated. e) Beginning in 2006, terraces were constructed. Starting in 2007 (a process that continued through 2013), the trees were planted. f) A count of the trees in the aerial photographs reveals that only about 300 were uprooted and not the 500 or 1,500 that is being claimed. b) As stated in the 2012 High Court decision, it was decided to cancel the petition with the consent of both parties. This was to allow the appellant time to legalize his construction. c) Since the legal process has not been completed, Israel is not evacuating the outpost buildings. 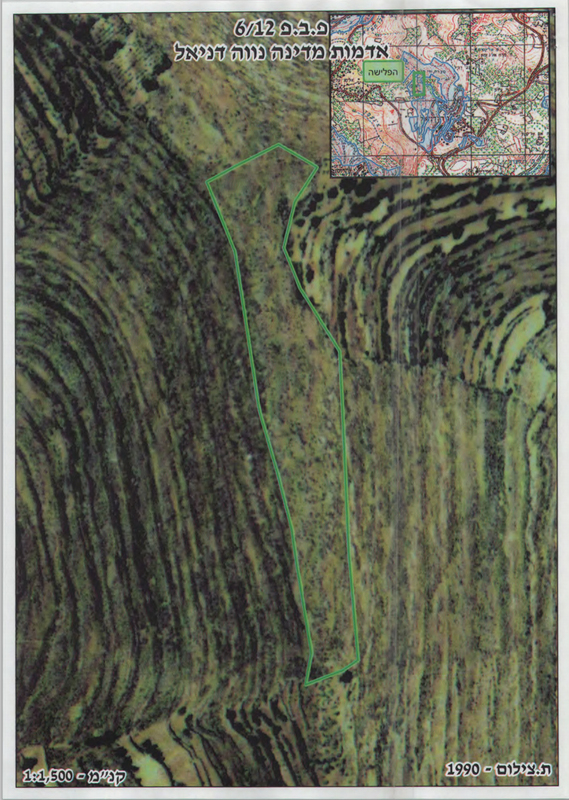 Below are the aerial photos of the valley in question for the years 1990, 1999, 2004, 2006, 2007 and 2013. 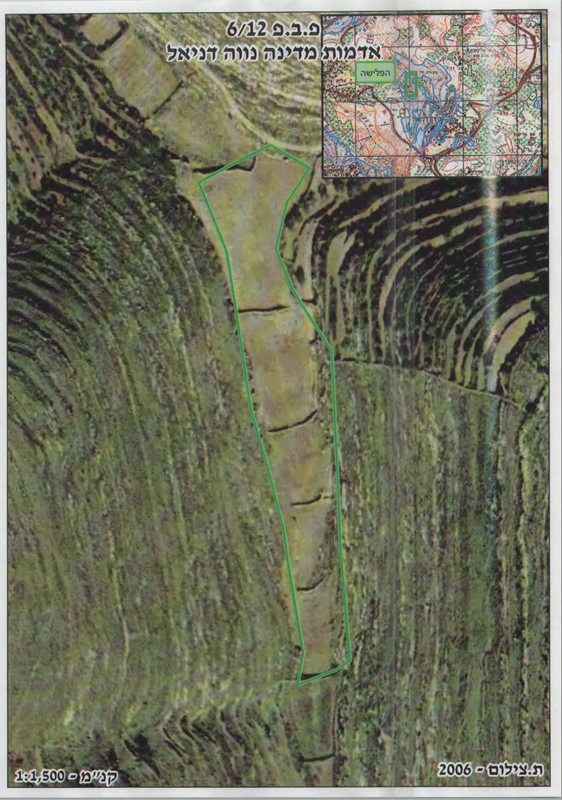 As stated above, the area tinted in blue in the 2013 photo shows surrounding public land.